Shadow has a home! - Rocky Mountain Great Dane Rescue, Inc. 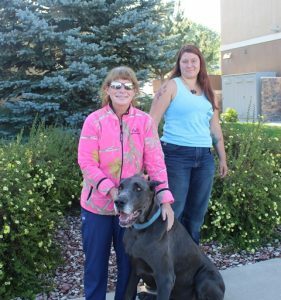 Shadow has a home with his new family in Peyton, CO! Peg adopted Bonnie from RMGDRI in 2015, and had to say goodbye to her earlier this year. Peg decided she was ready to bring another Dane into her home, and Shadow is that dog! Shadow will share his home with 3 fur siblings: Zander the chocolate Lab who is 11.5, Fred & Barney who are both 7 year old German Shepherd/ Aussie mixes, and a few cats. Shadow being 6 himself, will fit right in with his new pack, and they all will have tons of playtime and exercise on their 92 acre mountain property. With Peg’s work schedule, she can be home with Shadow more so than not, and be able to give him all the love and attention he needs. We are so happy for Shadow and his new family! Way to go sweet boy!